At the outbreak of hostilities in August 1914 Crossley Motors moved almost totally to war production. The only model made was the 20/25 which was supplied to the forces in huge numbers with production running at up to 45 a week. 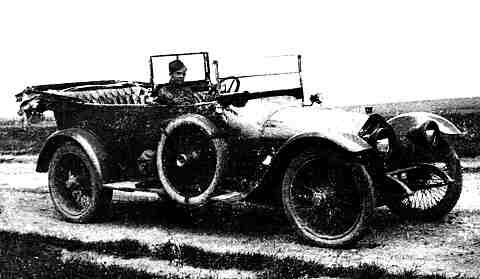 The first had been supplied to the Royal Flying Corps (RFC) in 1913 and at the outbreak of war they had 56. By the time of the armistice this had risen to over 6000. 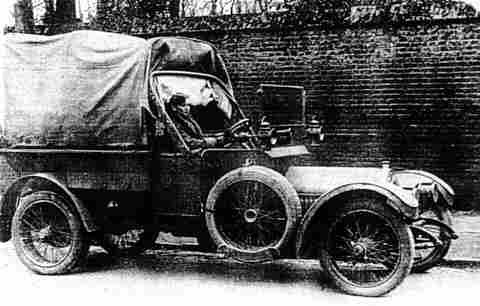 The 20/25, known to Crossley as the WO and the War Office as Type J, became with a tourer body, one of the standard staff cars (the others being from Vauxhaul or Sunbeam) but most of the chassis were used to carry ambulances, mobile workshops, light trucks and, most importantly, the RFC Light Tenders. 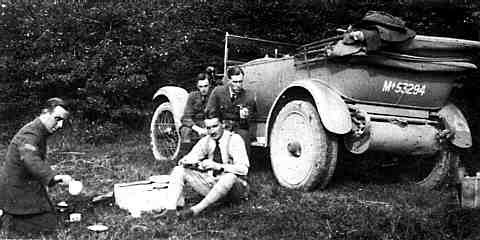 Every squadron in the RFC was supposed to be equipped with nine Tenders and one Staff Touring Car but it seems likely that most never had the full complement. 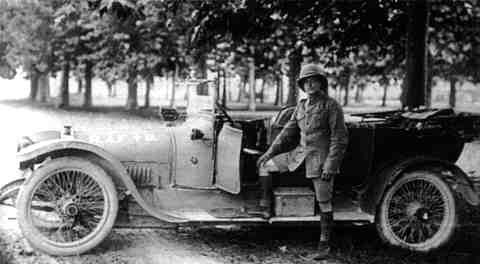 Vehicles went to France, Belgium, Mesopotamia, Salonica, Egypt, Russia, India and several parts of Africa. The Staff Touring Car had a very similar chassis to the pre war civilian 20/25 except for a lower back axle ratio, and had a 10ft 6 in wheelbase and 4ft 6in track. All of the military 20/25s had twin rear tyres with the rims spoke fastened to a single hub. With the standard RFC specification body the weight was 37 cwts. In 1913 at War Office tests at Brooklands a fully loaded Tender covered the flying half mile at just under 50mph. The 34 cwt Tender had room for eleven men, three in front with the remainder facing each other on bench seats down each side of the rear. Weather protection was by two hoods, one for the front and one for the rear. The ambulance could carry two stretchers down each side one above the other. Unlike the Staff car or Tender the rear of some of these was permanently covered with a fixed wooden roof made of plywood covered in fabric and mahogany sides on an ash frame. Neither Tender or Ambulance was fitted with electrics and had lower axle ratios than the Staff Car. The mechanical specification remained remarkably static during the war, the only major change being in 1917 when the engine was modified to give more power and improved cooling. 20/25's fitted with this engine were designated "25/30 X type" or just "X" type and some were fitted with the pointed radiator that was to become familiar on cars in the 1920's. At the war's end all government orders were cancelled. Some 20/25's went straight into store and many others returned from France. Some of these were rebuilt to the new 25/30 specification and stayed with the RAF the remainder were gradually sold off by the War Office. Many of these were bought back by Crossley, refurbished in the newly acquired AVRO factory and sold as AVRO RFC's mainly as bare chassis or with van bodies. Sales continued until 1924. There was a proposal for the Russian government to build the 20/25 and the 15hp under licence at the BEKOS factory near Moscow and by Lebedev at Yaroslavl. At least one car was made at each factory but then the Revolution intervened. The Yaroslavl plant was completed and is still in existence today producing diesel engines. The Gorton factory also, in 1918, produced aircraft engines mainly 900 of the Beardmore 160hp and about 80 Bentley Rotary Mk 2's. Remarkably few of the thousands of 20/25's made have survived which probably reflects on their hard lives in peace time. As well as several examples in private hands there is a tender on display at the RAF museum in Hendon, London and an ambulance in the Australian National Museum. After the war the 20/25 continued in use by the RAF for several years and saw service in Iraq, Persia and India. used by London's Metropolitan Many ex military vehicles were reconditioned and supplied for many years in either chassis only form to coach builders or with Crossley's own truck bodies. As well as road vehicles, Crossley also produced aircraft in a new government factory built on the 15 acre western half of the Crossley Brothers site at Erwood Park in Heaton Chapel, Stockport. This factory known as Government Aircraft Factory Number 2 was managed by Crossley Motors and had an initial order for 500 D.H. 9 bombers. The first one left the works on 16 March 1918 and by the Armistice over 400 of the order had been completed. A few D. H. 10's were also made. The factory and its contents was bought from the government by Crossley Motors in 1919 and later became the home of Willys Overland Crossley.